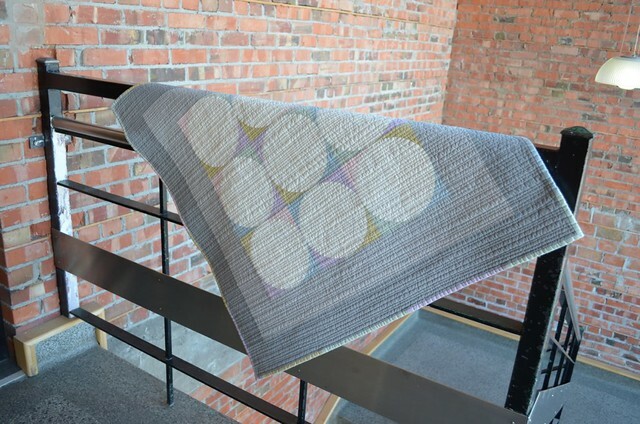 she can quilt: Hint - Ta Da! Let me introduce you to my latest quilt, Hint. She is about 40" square. She was made using a half metre package of Scandinavia shot cottons from Oakshott Fabrics. 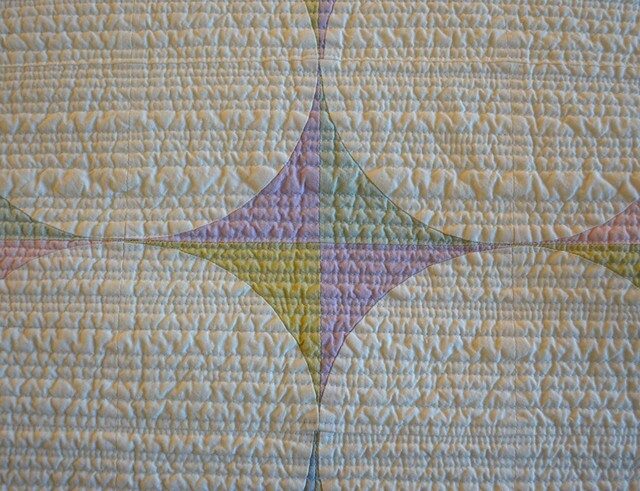 She was quilted with straightish lines with random spacings from 1/8" to about 1". 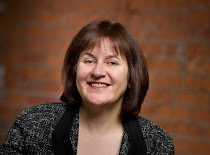 I designed Hint for Oakshotts to show off these stunning fabrics. 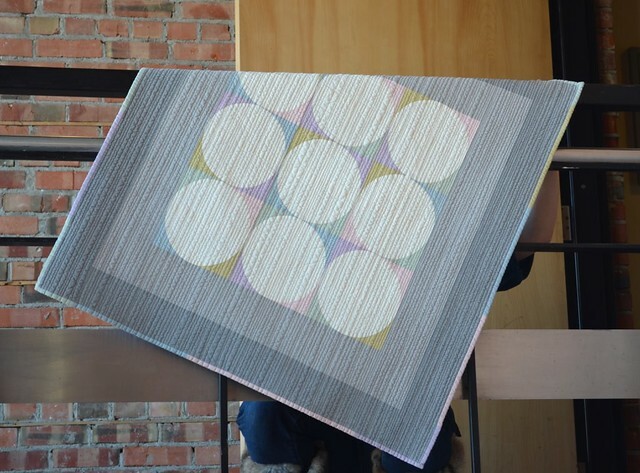 One of the two threads used to weave the fabrics is a beautiful snowy white and the other is colour (except for the one with two of white threads) and this creates light colours with a great deal of depth. The coloured thread is not really a pastel, so the light fabrics shine with a lot more colour than you would expect. Another thing about the Scandinavia line is that they have a nice weight. They seem to me to be lighter weight than a regular quilting cotton but not so light that they are difficult to use for quilting. They wash up beautifully too - all these photos are after the quilt wash washed and dried. This design is currently available as a kit from Oakshotts here but watch for more about it later this month on the Shotthrough Blog. My goal in making the pattern was to use just a single 1/2 metre pack of the fabrics - there is enough fabric to make the front, back and scrappy binding. The focus on using the 1/2 metre pack did require me to use different coloured borders, which is not my go to approach. But, now I have to say that I love them on this quilt, and it would be fun to change out the outside border to one of the colours as well or add a skinny border between the two in your favourite of the colours. The back is classic and really shows off the beauty of the fabrics. And I used a scrappy binding to bring out all the hints of colour from the centre of the motif, which hints at circles, and hence the name. 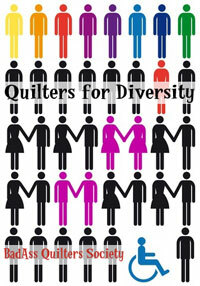 The pattern also contains the math to make a large 84" square bed size quilt too. I have set out the actual fabric requirements, but also 2 one metre packs would give you enough of all the fabrics for top, back and binding and a bit left over of some for further play. 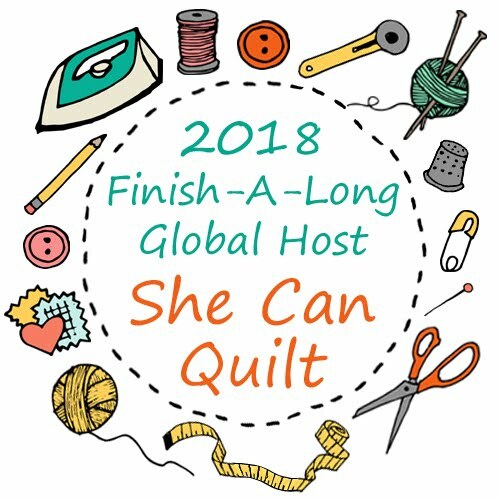 I am at QuiltCon, and thus the silence here on the blog - I've put a little on instagram if you cannot wait. You can see that Hint is here too, on display at the beautiful Pinwheels booth. I will have more for you tomorrow and over the week, it has been a great and overwhelming experience. Hint is a beautiful quilt. Really, I just find it to be stunning. Oakshott makes so nice fabrics. I love the coloes and the feeling of them. A very nice quilt! As always, just gorgeous! I have yet to use any Oakshott fabrics! I need to get with it! Love the softness to this piece! Hint is absolutely gorgeous! 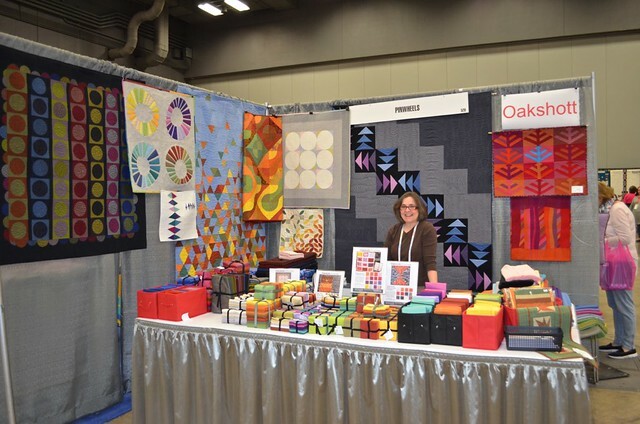 Gotta love Oakshotts (that is my quilt hanging next to Hint in the Pinwheels booth!!). And congratulations on Breathe! SO deserving!! Hint is fabulous. Luv the soft shimmer! 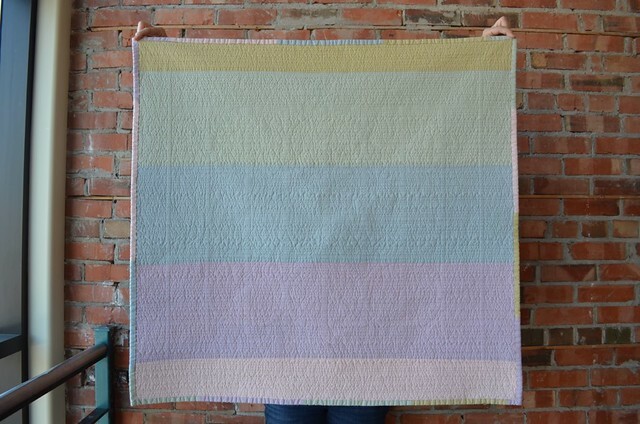 I like the subtle hints of colour in this quilt. I'm glad you are having a great time. This is so beautiful - like mother of pearl. 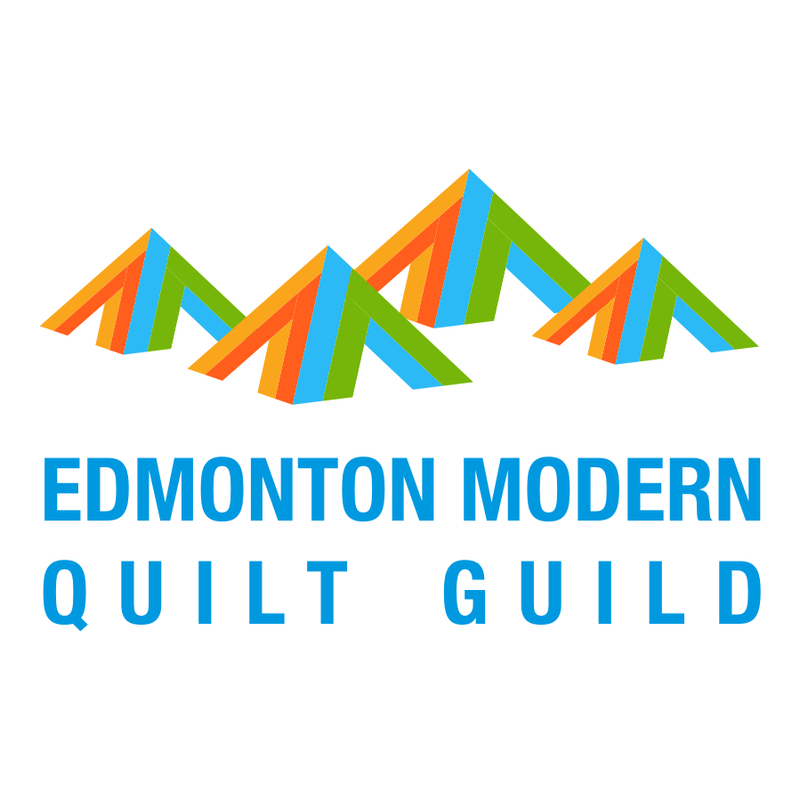 Congratulations on your success at Quiltcon! Another pretty, looking forward to your Quiltcon report. Beautiful. 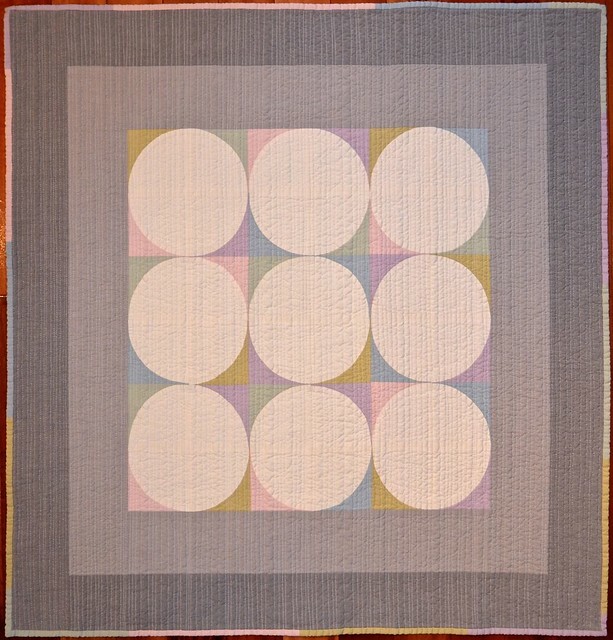 As is your winning quilt at Quiltcon. Congratulations. Congratulations on your win at QuiltCon. It is a beautiful quilt. Beautiful quilt! The link to the kit led to an error page, at least for me. Congrats on a beautiful quilt! I didn't get to see it at the booth :( Oh well. I saw one of your other quilts hanging in the show. It was great to meet you! Looks great and so does the booth! Beautiful quilt! 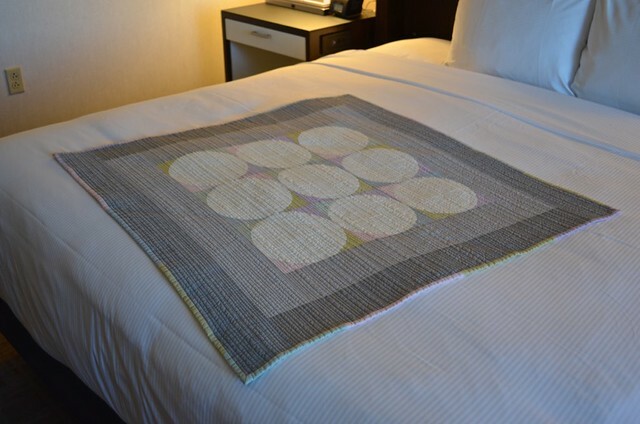 It makes me want to rub my hands over it to feel the quilting! Gorgeous. I tried the link fir the kit but it's broken. Is there a pattern to purchase? Where can you buy your patterns. I would especially like this one. Thank you.